The Iron Man is a trailer mounted high capacity flow device, available in two sizes. 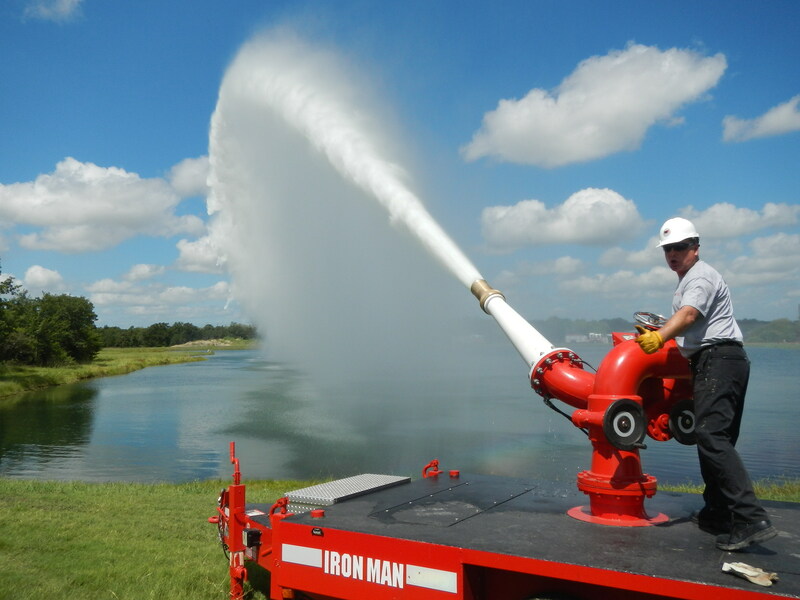 Depending on the model it utilizes a straight bore non-aspirating nozzle, capable of delivering a nominal 8,000 GPM – 10,000GPM of foam solution at a nominal pressure of 115 PSI at the inlet to the nozzle. The trailer body shall have an integral water tank for ballast and four jack stands, one at each of the four corners, to insure unit stability during flow operations. The monitor body, rotating joints, and nozzle shall be Stainless Steel ANSI-316 with Viton gaskets. Hand wheels shall be provided for Monitor rotation and elevation/depression functions and the Monitor shall be incapable of changing positions on its own. The Nozzle shall be equipped with a hydraulically operated pattern changer, infi nitely adjustable from straight stream to semi-fog pattern. The nozzle shall be capable of delivering, at its rated flow, an extremely tight foam solution stream with minimum fallout. A gauge shall be provided for monitoring nozzle discharge flows and pressures.